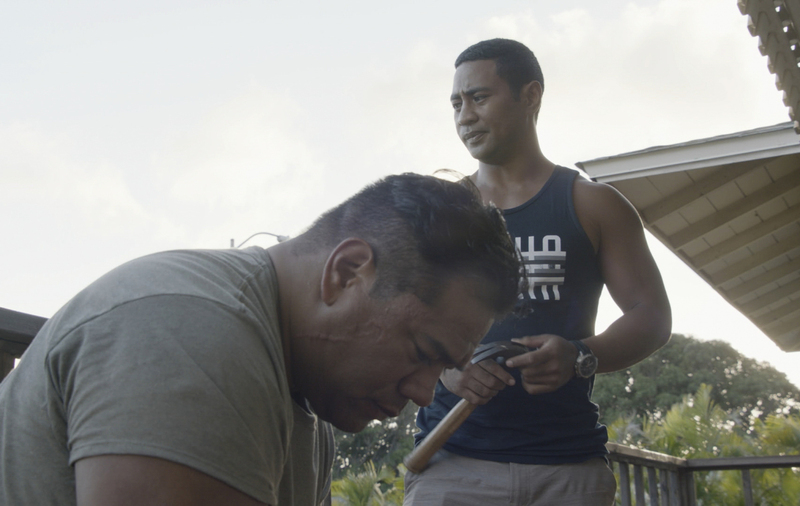 “Pupuhi ka he’e o kai uli” or “The Octopus Of The Deep Spews Its Ink” is the title of a new episode of Hawaii Five-0 airing tonight (March 15) on CBS. Five-0 investigate the murder of a window washer and find that the victim is actually a renowned street artist who may have a politically motivated bounty on his head. Also, Grover and Adam look into the murder of a gambler, and Junior helps his father when they are reminded of his sister’s death, on HAWAII FIVE-0, Friday, March 15 (9:00-10:00 PM, ET/PT) on the CBS Television Network. Recurring cast appearing in the March 15 episode include Willie Garson (Gerard Hirsch), Eric Scanlan (Natano Reigns), and Shawn Thomsen (Pua Kai). Additional guest stars include Patricia Velasquez (Teresa), Marlon Martell (Arturo Granera), Wayne Scott (Kahoni), Pomaika’I Brown (Lono), Ho’ano Rosario (Hoodie #1), Ryley Sickler (Hoodie #2), King Orba (Proprietor), Nicole Balick (Vicky), and Auriya Villeza (Maya Reigns).